In the heart of Scotland lies the magnificent valley of the River Dee. Rising high in the Cairngorm Mountains and running east to its mouth at Aberdeen the river flows through some of Scotland's finest scenery. 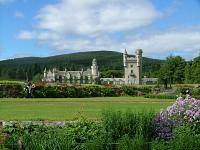 Midway, in the shadow of Lochnagar mountain, lies Balmoral Castle, holiday home of the British Royal family. The existence of the Estate was first recorded in the 1480's, but it only became a royal residence in 1852 when Queen Victoria and her husband, Prince Albert visited the Scottish Highlands, where they fell in love with the scenery and people and decided to buy a home there for private holiday periods. The original Balmoral castle was considered to small for a Royal residence and in 1853 Prince Albert set about designing a new building with the help of Aberdeen Architect William Smith. The result in all its Baronial splendour is the Balmoral castle of today. When Queen Victoria died in 1901, Balmoral Estates passed, under the terms of her will, to Edward VII and from him to each of his successors, and is still today the traditional holiday home for the Queen and members of her family. Today, Balmoral is a working estate, which provides for and is closely linked with the local community. The estate comprises 18,659 hectares owned between Balmoral, Birkhall and Glen Doll, with 2,940 hectares of grouse moor at Corgarff. There are seven Munros on the estate, while 3,000 hectares are afforested and 190 hectares are arable and pasture. From April until July the grounds, gardens and exhibitions are open to the public. A specially commissioned audio tour guides you around the displays and is available in English, French, German, Italian and Spanish. A selection of Royal Ball gowns will be on show in the Ballroom Exhibition, which is the only room in the Castle open to the public. Over the years the gardens have been improved and extended to include a formal garden, kitchen garden and a water garden. To make your visit complete relax in the Balmoral Coffee Shop or buy a unique gift from the Balmoral Collection Gift Shop. Nearby is the Parish church of Crathie, where The Royal Family attend Sunday morning service when in residence at Balmoral.